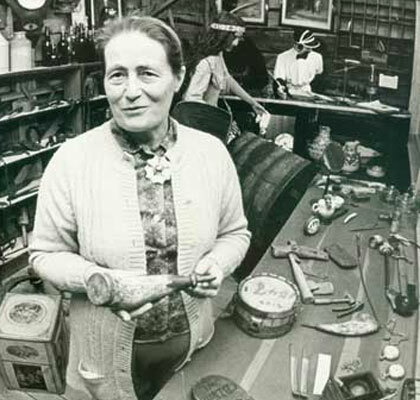 Mary Balf was the first paid curator of the Kamloops Museum, and left her mark by working in the area of the archives and the promotion of the written history of Kamloops. In 1955 she emigrated to Canada with her husband from her home in England, choosing to leave her profession as a doctor. She became the first woman president of the BC Museums Association and received the award of merit by the Canadian Museums Association. She was also honoured with the Queen's Silver Jubilee Medal in 1977, awarded to citizens who made a significant contribution to their community. Kamloops: a History of the District Up to 1914. History Committee, Kamloops Museum, 1969. Know Your Local History. Kamloops: s.n., 197?. The Mighty Company: Kamloops and Hudson's Bay Company. Kamloops Museum, 1973. 15 p.
The Overlanders and other North Thompson Travellers. Kamloops Museum, 1973. 15 p.
Ship Ahoy! Paddlewheelers of the Thompson Waterway. Kamloops Museum, 1973. 12 p.
Bunch-Grass Beef: Ranching in the Kamloops District. Kamloops Museum, 1978. The Dispossessed: Interior Indians in the 1800s. Kamloops Museum, 1978. Why That Name? : Place Names of Kamloops District. Kamloops Museum, 1978. Chase: the Man and the Village. Kamloops Museum, 1980. Savona's Ferry. Kamloops Museum, 1980. [BCBW 2016] "Local History" "First Nations" "Place Names"